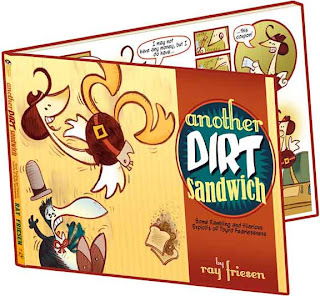 ANOTHER DIRT SANDWICH poses a conundrum for the educational book reviewer. Oh, it’s funny enough – stuffed with jocularity like a deer head on an Arkansas mantelpiece. 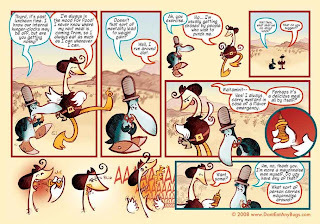 The droll Tybrd Fearlessness meanders through life any way he can, including duping the unsuspecting traveler (as the locals have his number) all the while throwing jokes here and there, cramming them into the comic frames as tightly as circus clowns in a Mini Cooper. The quandary comes in the form of categorization. How does one classify ANOTHER DIRT SANDWICH? The story and art are not quite aligned with the reading level. In other words, the story is targeted toward a younger audience, but the vocabulary is consistent with older, sometimes much older, students. Vocabulary: Now this is where Friesen’s work shines on an educational level. Not only does he provide students with “juicy words” – as I often describe them to my students – he writes in such a way that students can easily use semantic and syntactic cues to decode the higher-level vocabulary, thanks to the short sentences and the illustrations. Combine this heterogeneous coupling of story/art (young) and reading level (not so young) with the possibly controversial elements of a bar, gambling, cigars, references to an injured groin, and an almost-cursing with the word “arse” cleverly hidden by another dialogue bubble (page 98), and we have the make-up for a book that kids will enjoy, but some parents and teachers – unfortunately – might not. That does not make the book bad, at least in my eyes, and it should not be dismissed outright. 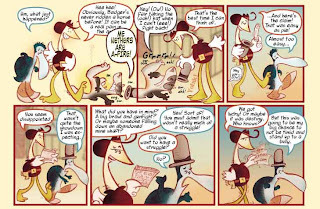 I find that kids enjoy and learn from books that might be considered questionable by some. I know plenty of families and teachers who strongly object to CAPTAIN UNDERPANTS, which I find boggling. I suspect the decision is mostly dependent upon where a school is located and the standards and cultural traditions of the community. For my part, I think this book (in its entirety) might push the line for many of the schools in my hometown, but I can always pass it along to my daughter when her reading ability is high enough that she can use her strategies to make sense of the strong vocabulary. I would highly recommend ANOTHER DIRT SANDWICH, or parts of it at least, particularly when educators are teaching syntactic and semantic cueing strategies. If schools could purchase a pdf version of the book, or subscribe to one online, then those using interactive white boards could post a page or two and allow the students to work in groups to decode the vocabulary. (The first chapter is available online as is a trailer.) This approach would render the few rebarbative pages mute, as the teacher could simply skip them. Keep in mind, the setting of the book is the old west. So bars, gambling, and cigars are appropriate to the time period and there is nothing in the book that is not accessible on television or radio. It should be noted that the word “a lot” is misspelled as “alot” several times in the book. Other words are purposefully misspelled. It was unintentional on the part of the author and was an editorial mistake. 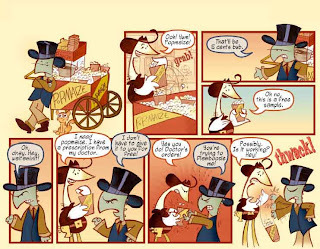 Such is the life of self-publishing. The same has happened on this very site, so we are sympathetic. We also strive for proper spelling and grammar with our students, ourselves, and in the books we recommend. So what do we do with it, now that it is published? I offer this solution: Challenge your students to find the misspelled word and even consider a prize for the winner. Students will delight in the friendly competition. Then use it as a teaching moment to remind them that we all strive for perfect spelling and grammar. It’s also good to be reminded of one of my favorite Japanese sayings: Even monkeys fall from trees. What to do with ANOTHER DIRT SANDWICH? Ultimately, I am splitting my decision. There are strong reasons to use the book for multiple educational purposes; however, there are communities in which some elements would cause distress. I recommend teachers consider their class, parents and guardians, and community. Certainly, a teacher who is uncomfortable could use the book, leaving out the few precarious parts. To leave the book behind without giving it its due would be a serious mistake on the part of the teacher, librarian or parent. ANOTHER DIRT SANDWICH has so much to offer a child and it should be seriously considered.